I believe that the biggest and cheapest way to make a room look like it had a make over is by decluttering and organizing. The less clutter you see in a room, the cleaner it looks. The more organize a room is, the better it looks. This week, we had company over, so I had to clear up the powder room. Mind you that the house I'm staying a currently has quite dated decorations. I figured that once I move out, I can start decorating to my own taste, but for now, I can only do little changes that won't cost me a fortune. The powder room we have is average size, but there is really no space for storage. The only thing that really had storage space was the medicine cabinet behind the mirror. (Which is another project that I want to tackle) I wanted to make use of what we currently had and spend as little money as possible, because again, I plan to move and I'm really not sure what I'll be bringing when it comes time to moving. The next thing you have to make sure of is that there is very little clutter that goes on these shelves, especially because it is an open shelf. I placed our toothbrush and toothpaste in a jar that I got from the Dollar Store. It is clean and crisp which is the look I am going for. I wanted to keep the color palette in the brighter side to represent Summer. I found this tray from TJ Maxx for only $5. It was perfect because It had a place for everything I wanted to put on it. I had two candle jars that I emptied out and turned into a cotton swab and cotton pad holder, and the face flower that I go t for $.50 at a thrift store! I really didn't have that much decor, because it is a small space and I don't want it to be overwhelming. The artwork was where I had most trouble. I really didn't know what was good artwork to put in a bathroom, so I just chose something that I liked. I go the frames from the Dollar Store as well. The prints were just things we found online and printed out for the mean time. I really want to get something nice from etsy in the future. 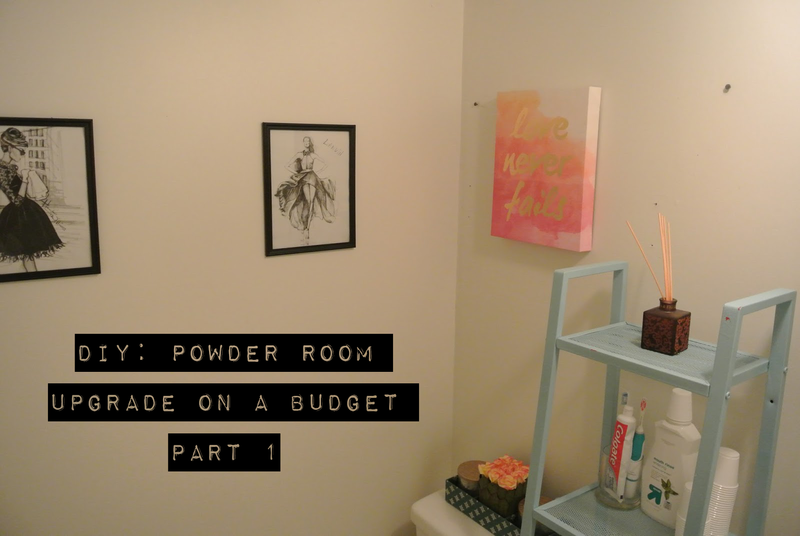 This powder room is nowhere near complete, but I wanted to update you with this quick change that I did to it...kind of like a part one to an update your powder room post! Do you have any suggestions on cheap ways to upgrade this small powder room? I would love to hear your thoughts. Leave a comment down below!